Pollos power! Señor Juan Aguacate is donning his famous Lucha Libre mask once again to save the Mexiverse in this dimension-swapping sequel. Following a quick recap of the final battle that took place in the first adventure, we see our pro wrestling hero basking it out within the comforts of family life. Juan has laid on a few pounds since his last outing as he waddles his way around his home, searching for his two energetic kids hiding from their Papa. Suddenly, huge Tetris-like voids begin to eat away at his village, causing chaos and panic all around. This leads to Juan diving out of his comfort zone and leaving his family behind in order to bring stability to the Mexiverse and the timelines that bind it. 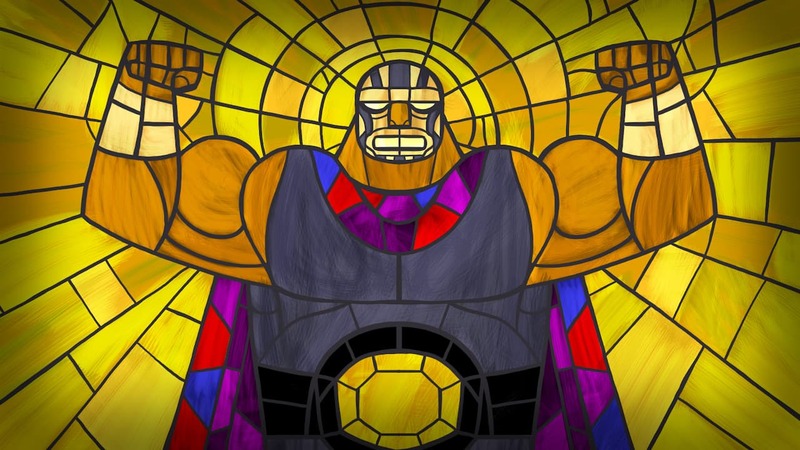 If you have played the original, then Guacamelee! 2 will feel very similar in most aspects. If anything, it may even seem a bit too familiar for those who recently elbow-dropped into the first game on Nintendo Switch only a few months back. However, the first Metroidvania-style platforming adventure did have excellent level design, an interesting use of abilities and a gorgeous pallet of artwork heavily themed on the traditional Mexican celebration, Day of the Dead. Despite wholeheartedly enjoying Guacamelee! Super Turbo Championship Edition, I must admit that once I realised I had to jump through hoops again to reclaim Juan’s special abilities, I was pretty sceptical in wanting to do it all again so soon. Thankfully, Juan gets up to speed pretty quickly and then some, as he brawls his way across levels that somehow manage to surpass the original in both level design and challenge. The original adventure was well-known for its multi-coordinational platforming aspects. For example, you could extend the height of a jump by using the super uppercut, to then cover lateral distance mid-air to reach a ledge with a super dash-punch. Mix that with the screen transition mechanic found in the latter stages of the first adventure, and you were soon juggling buttons mapped around the controller like hot potatoes. Guacamelee! 2 expands on this mechanic even further by implementing even more of Juan’s fancy moves. His main new feature goes by the way of the eagle-shot, an ability that has you catapulting off golden eagle medallions above lava and under spikes like a Mexican Spider-Man. You can keep the kinetic flow going even longer by spitting beats of uppercuts, dash-punches, screen transitions and wall-jumps to shake up a fine concoction of parkour within expertly-crafted level design. The chicken transformation is also back, but this time it’s far more fleshed out since the first outing. Just like Juan can in human form, the Pollo Creed of platforming can now peck, throw and employ new abilities to aid both his navigation and attack properties. In filling out the chicken abilities, Juan must conquer tricky dungeons within golden pollos located around the Mexiverse that will test your platforming skills to the limit. The inclusion of such areas keeps this fantastic sequel in a constant free-flow of things to do and conquer. Mix that with Juan’s human upgrades and you have a traditional spicy recipe of platforming addiction that still feels incredibly fresh, regardless of how crowded the genre has now become. Where the Guacamelee! games really set themselves apart from the competition is in how its simple but deep combat system dance across the screen. A quick one-two-three followed by an almighty uppercut can send an enemy airborne. Follow that up with a downward smash, chased down with a stiff bodyslam and finally sling that sucker into one of his ghoulish pals to keep stringing attacks relentlessly satisfying in locomotion. Big combos result in big rewards, allowing you to conveniently purchase perks with coins to improve your overall strengths. It’s within its combat that truly evolves upon the underpinning Metroidvania foundations and the heart and soul of what Guacamelee! is all about. Which goes to say, despite the familiar presence of backtracking that has always been a staple point in the genre, Guacamelee! 2 does a great job at doing so with much more diversity than to merely pad out the formula. Due to the one-hit-kill Tetris voids that later invade the world at a terminal rate, revisiting areas soon becomes a new obstacle course to take on in their own right. The easy to follow map system also keeps you in check into where to go next, as well as routes towards undiscovered areas to tempt you off course. Secret areas or special chests can be found in such corners of the map, but to get to these wonderful loot-filled boxes you must earn the right to them first. If you see the word LUCHA! splash across the screen, you know it’s time to tango. Overwise, get ready for some serious finger gymnastics until you hit a perfect 10 like Nadia Comăneci in 1976. As with Guacamelee! Super Turbo Championship Edition, up to four players can put their wrestling skills to the test in local co-op. And just like the first game, the ability to journey into the world of the dead with a room full of buddies is just as impractical. Not to say that it isn’t fun. Having at least one friend working alongside you in synchronisation when dimension-warping with tight coordination is certainly a standout achievable feat. However, because the levels aren’t really designed for multiplayer in mind, things can begin to get really messy when the challenge spikes demand multi-tasking concentration. The sequel also has the same issues as the first game when it comes to dropping out in co-op. There’s no option or really any easy way to do it unless you exit Guacamelee! 2 completely. Both the visuals and sound are as glorious as ever, full of vibrancy and true to the artistic tone of Mexican flavour. It keeps the personality of the first adventure perfectly while improving upon the design with lashings of detail and lag-free finesse. Returning characters have plenty of personality as do the new, with plenty of references from both gaming and popular culture intact. Some may find such references a little tiring due to so many indie games nowadays shoe-horning them in, but at least they are not constantly shoved down your throat at any given turn in this case. If anything, I personally found such callbacks pleasing for the most part. Watching a poor bystander in shock as you force-feed his ride with fists and belly-flops makes a nice callback to a certain fighting game’s bonus stage. As its primary criticism, Guacamelee! 2 could very well be deemed as more of the same. In any case, the attention to incredible level design and gameplay value proves that DrinkBox Studios had plenty more tricks to show with the old tools in hand. As for first-timers, if you don’t mind being spoiled by the final goings-on of the first adventure, then this sequel is definitely approachable enough for you to dive straight into it blindly. Either way, both games are fantastic games in their own right, but Guacamelee! 2 stands prouder with its chest out as a worthy sequel that should not be overlooked by anyone with a Nintendo Switch.